The number of modular homes being built is rising, as is their popularity. Modular homes are a quicker and easier way of creating your perfect living space, so it’s no wonder they are becoming more and more and more frequent. Whether you have a big or a small space to work with, there is a modular home design available – and this is the beauty of them – they can work anywhere. But what is a modular home? How do modular home designs differ from ‘normal’ homes? And how do pre-manufactured homes measure up against their traditional counterparts? If you are looking at investing in a modular home, we’ve got everything you need to know about them to help get you started. An excellent question. Modular homes are homes which are built off-site in pieces, then assembled on site, on top of foundations, by your chosen builder, to form a modular house. They look just like ‘normal’ homes, and you’ve probably happened by them without even realising; they are essentially pre-manufactured homes which need to be assembled, just like flat pack furniture. Don’t get them confused with mobile homes, as these can’t be picked up and moved; they are permanent. They look great and you’d be hard pressed to tell the difference between them and a traditional structure. How is a modular house different? Pre-manufactured homes can be put up in weeks, rather than the months it can take to build a normal home. There are a lot less elements which need to be completed on-site in comparison to a normal home, and they don’t see delays due to weather or supplies like you would often see in a normal house build. Even though they are different, they still have to conform to building codes and the same rules and guidelines as any other home. It’s hard for us to say how much a modular house would cost you to build, as it all depends on how big or small it is, and the design and style. However, they are usually less expensive than your traditional on-site built home, per square foot. This is down to the speed of the manufacturing process for pre-manufactured homes, there being no weather delays and the fact that a lot of the inspection can be done before your home is even delivered. That being said, each build is different, so make sure you’ve done your research before you dive into it. Are modular homes better for the environment? Modular homes are really energy efficient in comparison to a lot of traditionally built homes, so you’ll save on your energy bills as well as on your modular home cost. If you are environmentally conscious, this might be a consideration for you, as any energy which can be saved is a huge plus for the environment. Do all modular home designs look the same? No, not at all. One modular home design looks very different from the next. You can encompass pretty much any style of home into your modular house build, from modern modular homes to homes which are more traditional looking. You can even get creative and design your own home, you don’t have to choose an already available option – with the help of those in the know, you can have your modular house just how you always dreamed it. 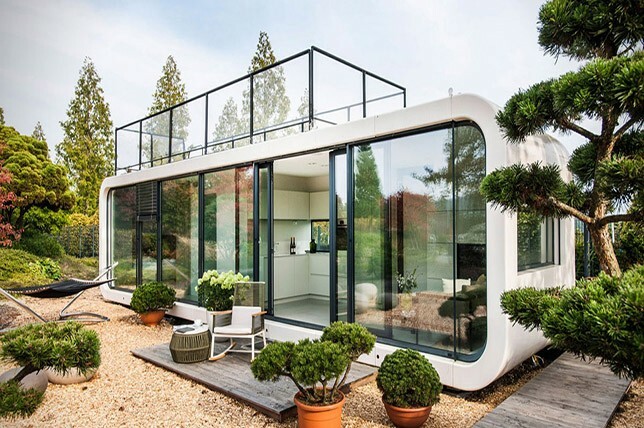 There are some stunning bespoke modern modular homes out there, from a tiny modular house built to fit in the smallest of spaces, to modern modular homes built to blend seamlessly into their surroundings. What if I don’t have much space? If you don’t have much space, never fear! Modular homes are perfect if you don’t have much room to play with, and with a bit of clever design, you’ll be able to create a home with a well thought out space. From small cabins, to modular home designs with a cottage feel to them, or a modern bungalow design, brilliantly decorated tiny modular homes are popping up all over the place. With small living becoming more and more popular, and the design of such tiny modular homes becoming something of a competitive challenge, small modular home design is becoming increasingly popular. Some of the designs are truly stunning and whether you have 500 square feet or space, or 3500 square feet of space, there is a modern modular home out there just waiting to be had. Can I choose a standard design? Yes, you can choose from a selection of different designs from a chosen company – this is good if you have an easy space to work with and you don’t want the hassle of coming up with your own design. There are modern modular homes and traditional designs you can choose from, as well as homes suited to a particular area of living, such as urban, beachside or rural. This is a simple and easy way to do it, as well as the most cost effective. As soon as you begin changing things and adding to a design, the expense can start to rack up, so if you are on a tight budget, choosing something which has already been designed will be a cheaper option. Can I custom design a modular house? Yes, yes and yes. There are plenty of companies out there who can help you to custom design your very own pre-manufactured homes. You have a couple of options when it comes to custom designing modular homes. You can customize a standard design, including the additional features you want, whether that’s a deck, a different style of façade or switching the layout around. This option is good if you just want to make some minimal changes, without changing the essence of the design too much. Your other option is to completely custom design your modular home. If you have a thought in mind which just can’t be replicated with a standard design, you have a particular need you need to cater for, or you just love having something completely different – then this is the way to go. However, just remember that if you are starting a design from scratch, there is always going to be a cost element to consider, and a custom design will take longer to create as well.